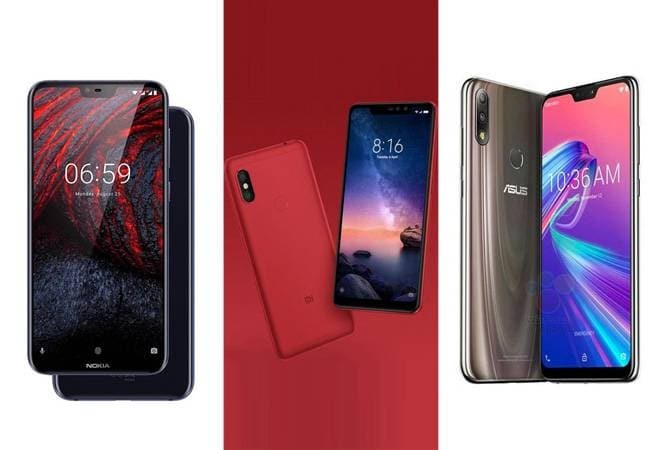 Three devices that are creating ripplea in the mid-range segment are the recently launched Xiaomi Redmi Note 6 Pro and Nokia 7.1, and the upcoming Asus Zenfone Max Pro M2. There's never a dull moment in the mid-range smartphone segment, even with similar looking competitors with comparable specifications and price tags. As always, the segment is jam-packed with options to choose from, with some recent as well as upcoming offerings showing promise. Three such devices are the recently launched Xiaomi Redmi Note 6 Pro and Nokia 7.1, and the upcoming Asus Zenfone Max Pro M2. The Xiaomi Redmi Note 6 Pro and Nokia 7.1 were launched in India last month, whereas the Asus Zenfone Max Pro M2 is scheduled to be uncovered on December 11. While the Redmi Note 6 Pro is available through flash sales, the Nokia 7.1 went on sale in India from today, and the Zenfone Max Pro M2 has been surfacing in leaks now and then. Here's how the three competitors size up against each other in a comparison of spec lists. First things first: all the three smartphones come with display notches, and that means 19:9 aspect ratios all around. The Xiaomi Redmi Note 6 Pro comes with a 6.26-inch display with pixel density of 403ppi under an unspecified version of Corning Gorilla Glass. The Nokia 7.1 has the smallest screen in the bunch at 5.84-inch, but the highest pixel density at 432ppi. The fact that it comes with support for HDR10 gives this particular display an edge over the others. Lastly, going by the reports, the Asus Zenfone Max Pro M2 has the biggest screen among the lot at 6.3-inch, but only 400ppi. The screen is protected by Corning Gorilla Glass 6, which the company claims makes the device most durable in the segment. The Xiaomi Redmi Note 6 Pro and the Nokia 7.1 are running Qualcomm Snapdragon 636 chipset. The Asus Zenfone Max Pro M2, on the other hand, is rocking the much-powerful Qualcomm Snapdragon 660 AIE. Coming to memory options, the Xiaomi Redmi Note 6 Pro is the only smartphone among the three to sport a 6GB option, and a 4GB option to boot. There is only 64GB of internal storage option with this device, which can be expanded to 256GB. The Nokia 7.1 comes only with 4GB RAM and 64GB internal storage, and expandability options allow for microSD card support up to 400GB using the SIM 2 slot. Lastly, only the 4GB/64GB variant of the Asus Zenfone Max Pro M2 has been revealed so far. In the optics department, the Xiaomi Redmi Note 6 Pro comes with a quad camera setup, with two sensors at the back and two at the front. The rear dual camera setup on the Xiaomi device features a 12MP primary and another 5MP sensor for depth perception. Up front, housed in the notch, are two more sensors: 20MP selfie sensor and 2MP secondary sensor for the bokeh effect. The Nokia 7.1 features the same dual camera setup at the back as the Redmi Note 6 Pro - with 12MP and 5MP sensors - albeit with slight changes in the aperture and Zeiss lenses on top. Its front has an 8MP front camera. The Asus Zenfone Max Pro M2, meanwhile, will reportedly feature a dual camera set up at the back with 13MP and 5MP sensors, and a 13MP selfie shooter at the front. The Xiaomi Redmi Note 6 Pro comes with MIUI based on the Android 8.1 Oreo out of the box, whereas Nokia 7.1 stock Android 8.1 Oreo under the Android One program, with promised upgrade to Android 9.0 Pie. Asus Zenfone Max Pro M2 is rumoured to run Android 8.1 Oreo out of the box. The price for the base variant of Xiaomi Redmi Note 6 Pro with 4GB RAM is Rs 13,999, whereas the higher 6GB variant is priced at Rs 12,000. The Nokia 7.1 went on sale from today at a price of Rs 19,999. According to reports, the Asus Zenfone Max Pro M2 could be priced around RUB 17,990, in Russia, which translates to around Rs 19,000.